For those of you runners, you know what I mean when diarrhea and running go together. 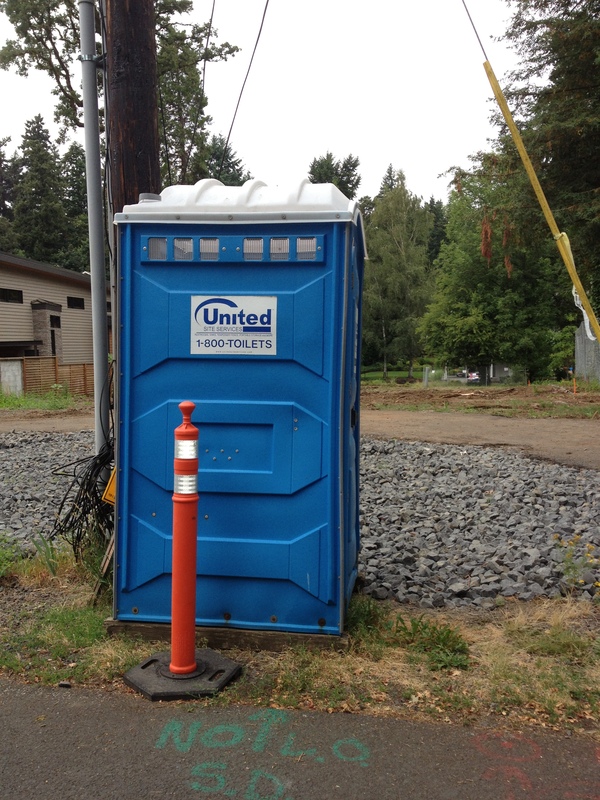 I suspect this is more than you want to know, but after using porta-pottys all weekend, I observed that lots of runners do in fact have diarrhea! 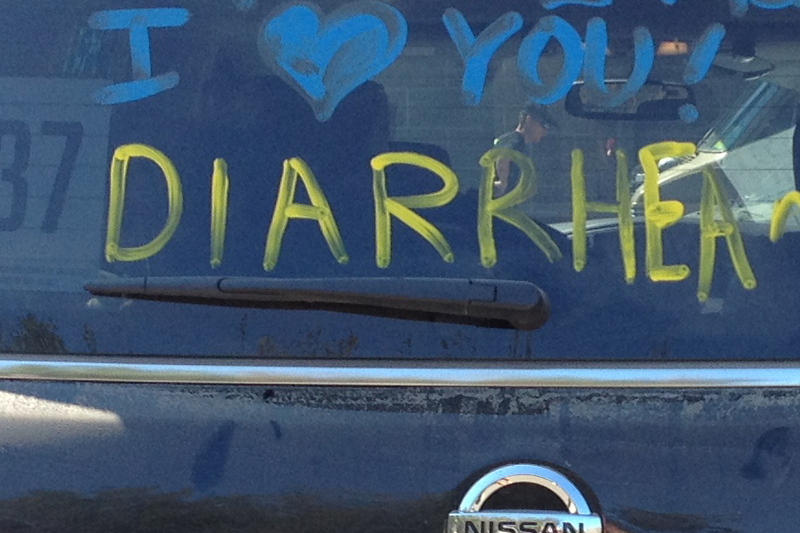 I wasn’t surprised to see several vans painted with the word “diarrhea” on them… here’s a picture of one of them! As an avid runner, I have had many times when I was in the middle of a challenging run when the diarrhea cramps hit. I know where all the public bathrooms are on my routes, as well as restaurants I can dart into if needed. 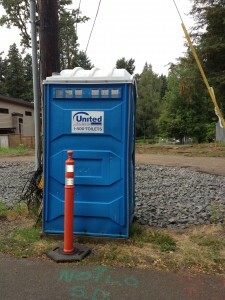 Other times, I have been forced to use one of the porta-potties they have in front of homes that are under construction. UGH! Did you know that diarrhea affects an estimated 30-50% of runners? 1. When you are running, blood flow to the intestinal tract is diverted to the muscles. Therefore, any food in your stomach and intestines is not getting digested. By the time it gets to the colon, the bacteria in the the colon are trying to break down the extra sugar that is leftover from digestion. The bi-products of the bacterial breakdown cause gas, bloating and diarrhea. 2. Depends on what you ate prior to the run. High fiber foods and dairy products (especially if you are lactose intolerant) are more likely to cause diarrhea while running. 3. Hormones stimulate transit time, particularly in women. That means anything in your intestines will move through even faster than normal. 4. An interesting study demonstrated that cyclists do not have as much diarrhea as runners. This may be due to physical jostling of stomach and intestinal contents. 5. Gels & shot blocks are very sweet and high in osmolality. This tends to pull water into the gut, causing severe cramping and diarrhea. Eat small amounts of easily digestible carbohydrates and low fat protein prior to a run. Examples: peanut butter & crackers, low fat yogurt, a small bowl of low-fiber cereal with skim milk, fruit & cheese, smoothie or shake, 1/2 lunchmeat sandwich with very little else on it. Test different gels and blocks to see if you tolerate some better than others. Drink them with plenty of water so you don’t have a huge glob of sugar hit your gut while running. On race days, I take two Imodium before leaving the house. Caffeine worsens diarrhea. Moderate your intake of coffee, tea, energy drinks, and performance gels that include caffeine. Get plenty of sleep. I don’t know about you, but my gut always reacts poorly to a run when I haven’t slept well the night before. I can tell you that this year during Hood to Coast, I did not have any tummy trouble (well, except car sickness, but that’s another story!) It was through good dietary and fluid management that I survived 36 hours of alternating running, sleeping, and eating in a van with five other people. It was so much fun, I can’t wait to run again next year.